Forgot to take that ground beef out of the freezer this morning and now it’s 4:00 and your kids are begging for tacos? 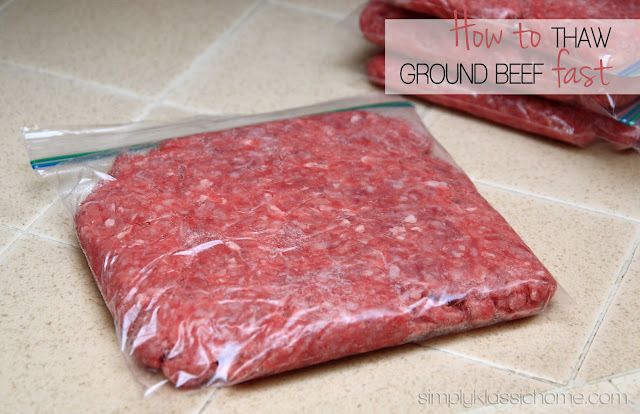 Never fear – I’m going to show you to freeze your ground beef so you can thaw it quickly – in under 20 minutes – with no microwaving! One of those meals was my dad’s “famous” (in our house anyway) meatloaf. I’ll share the recipe with you later in the week, but I wanted to first share a little tip with you that I learned not too long ago that has made my life a heck of a lot easier. If you already knew this, do me a favor and humor me, k? I like to buy the bulk size packages of ground beef, but because we are a small family, I can actually get four meals out of a package. I used to just cut the package in four equal parts and wrap and freeze it in a big chunk. But it would take FOREVER to thaw, and forget it if you just decided on the way home that you were making tacos. 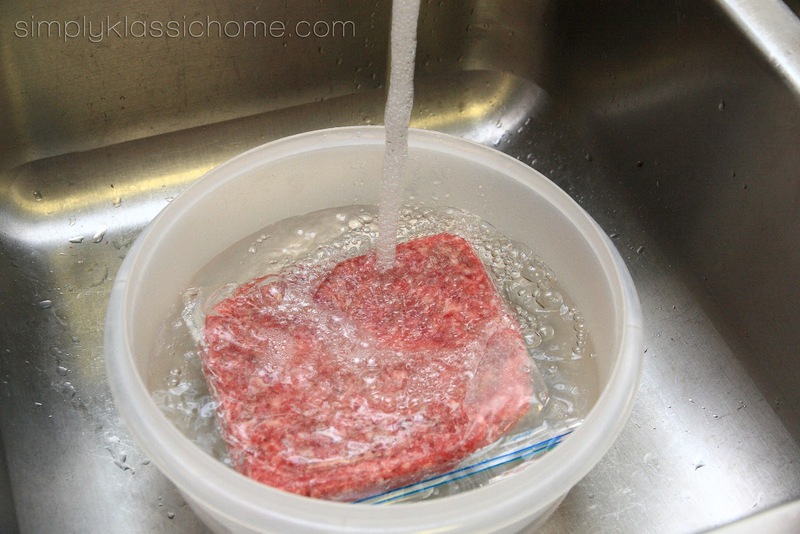 There was just no time to thaw the meat, and I hate thawing meat on my kitchen counter. After cutting the four equal chunks, I placed each portion in a sandwich size ziploc bag, flattened the meat, squeezed out as much air as possible, and placed them all in a larger bag. I labeled the individual bag with the portion size (in this case it’s just less than a pound). 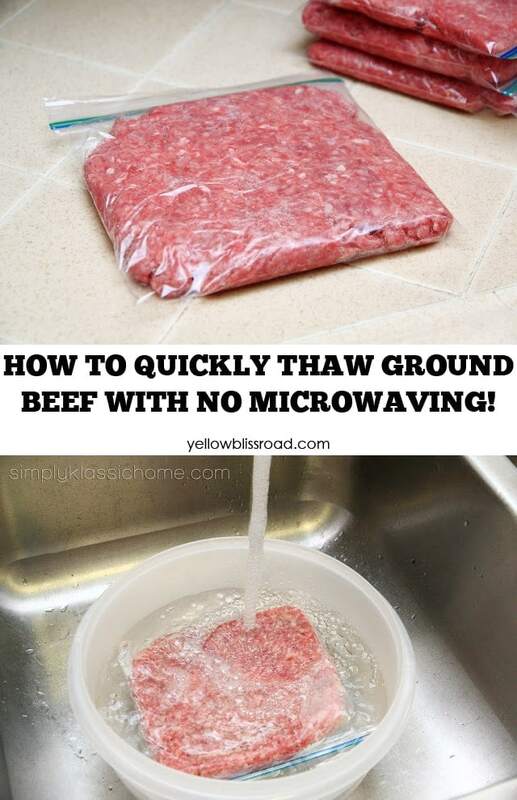 Flattening the meat makes for much less thawing time. In fact, just place the bag in a bowl of COLD water and it takes less than 30 minutes to thaw! or any other of a variety of options. I’ll share the meatloaf recipe with you later this week, as well as show you how I do this entire process, from frozen ground beef to hot, tasty meatloaf in under an hour. What’s your favorite tip from the kitchen? Thanks for sharing and it’s a great idea. Thanks, needed to quickly thaw some meat for last minute company coming tonight. You can do this with any meat. That’s what I have done for years, with chicken, pork chops, etc. 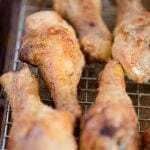 As long as it’s COLD water, there’s no chance of bacteria growth from not thawing it in the refrigerator. Yes, this is true. However other meats will take much longer than 20 minutes. 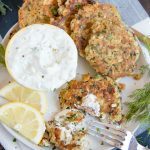 Love meatloaf and am looking forward to your family’s version! Oh…can not wait for the recipe! thanks for the great tip! !